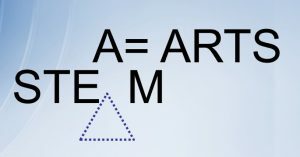 S.T.E.A.M stands for Science Technology Engineering ARTS and Math. STEAM is an evolution of the term STEM (Science Technology Engineering and Maths). A solid education experience in the arts and humanities is absolutely essential for STEM majors to be effective agents of change through the innovations they will operate or design in future. There is a need to dispel a myth that STEM majors cannot tell stories about how engineering and science make a difference to the fabric of our lives through personal experiences that matter. In a world of in-your-face information technology where many are losing their social skills of interacting with fellow human beings, emphasis on STEM needs to be modified to STEAM. With ARTS, STEM majors can build truly meaningful engagement with end users and stakeholders to build lasting solutions.